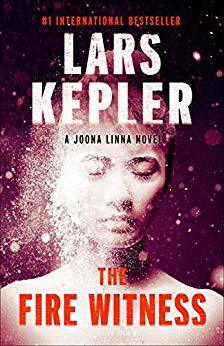 Detective Joona Linna investigates two grisly murders at a home for wayward girls in FIRE WITNESS, the third installment in this Scandinavian crime series. With unrelenting tension and propulsive pacing, these books have become some of my favorites. Written by the husband-and-wife team of Alexander and Alexandra Ahndoril, the series follows the flawed yet clever Joona Linna, who probes into the most gruesome crimes with sharp intuition and dogged determination. In FIRE WITNESS, the novel opens as we witness a brutal crime in a home for teenage girls. Before the sun rises, two people are dead (bludgeoned to death) and one girl is missing. But when a bloody hammer is found in the missing girl’s room, the police are anxious to close the case and move on, but something doesn’t sit right Joona. To make matters more complicated, there’s a girl who claims to see visions and she has information that’s not been made public. Joona Linna digs deeper and goes down a path that explores not only the victims, but the girls involved and the past that continues to haunt some of them. As with the other books in the series, I flew through FIRE WITNESS. It touts the perfect combination of nuanced characters, absorbing plot and immersive feel. The suspense and mystery of the case kept me on the edge of my seat. The narrative is atmospheric and unflinching in style. And of course, the characters—not only Joona Linna—are complex and interesting. It really is the whole package. Dripping with suspense and utterly enthralling, this is a must-read installment to an extraordinary crime series.